The state assembly election is slated to be held later this year, but veteran congress leader and state Chief Minister Virbhadra Singh has already swung into the poll mode and on inauguration spree across the state. 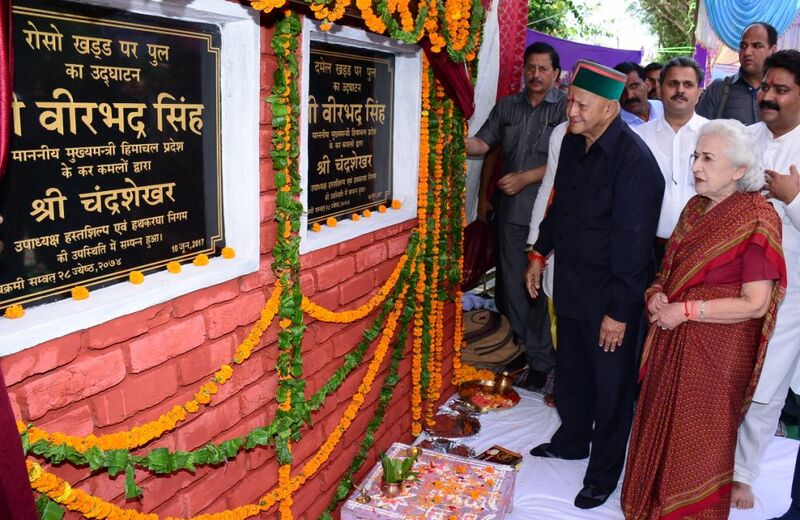 Latest in the series, Chief Minister Virbhadra Singh today dedicated projects around Rs.20.37 crore in his visit to Dharampur constituency in Mandi district today. The Chief Minister inaugurated Chaswal Bridge over Damel rivulet constructed with an outlay of Rs. 62.40 lakh and Roso Khud Bridge constructed with a cost of Rs. 70.95 lakh. He also inaugurated 33 KV sub-station at Mandap, on which an expenditure of Rs.4.10 crore has been incurred. The Chief Minister inaugurated Type II residential quarters for police force Dharampur constructed at cost of Rs 37.10 lakh, Science Block and additional rooms at Government Senior Secondary School, Sidhpur. The Chief Minister also inaugurated LWSS Scheme Seoh-Dhar to be constructed with an outlay of Rs. 4.09 crore which would facilitate 27 villages of five panchayats, a new rest house at Dharampur completed with an outlay of Rs 38 lakh and Primary Health Centre (PHC) at Darwaad constructed with an outlay of Rs. 64.30 lakh. He also laid foundation stones of 33 KV sub-station at Tanihaar to be constructed at a cost of Rs. 2.5 crore and laid foundation stone of Dudal Sajao Piplu LWSS at Sajao Piplu to be constructed with an outlay of Rs. 1.61 crore. The Scheme will benefit as many as 15 villages of the area with a population of around 6000. He announced police post for Tihra, polytechnic college for girls at Dharampur, up-gradation of Primary Health Centre Tihra to Community Health Centre and opening of Primary Health Centre Darpa-Bakarata. He also assured that all the other demands would be considered sympathetically. Chief Minister Virbhadra Singh also announced shifting of control of IPH division, Sarkaghat from IPH circle Hamirpur Zone to Mandi Zone. He laid foundation stone of Block Development Officer Residence complex to be constructed at a cost of Rs.1.02 crore. He also dedicated SDM and Tehsildar Office to people at Dharampur. He laid foundation stones of Foot Bridge at Son Khad and foundation stone of Foot Bridge on Naald Khad to cost Rs. 51.05 lakh and Rs.74.89 lakh respectively. He laid foundation stone of LWSS Maluha Thaati to cost Rs. 95.37 lakh and Seri Culture Information Technology Centre, Sidhpur to be constructed at a cost of Rs 30 lakh. He also laid foundation stone of Lift Irrigation Supply Scheme Sidhpur phase-II to be constructed with a cost of Rs. 56.52 lakh.